Inventory is low. Really low. That’s one of the big stories right now in real estate, so I wanted to spend some time kicking around some thoughts. Let’s take a look at ten things to know about housing supply in Sacramento. If you aren’t local, I hope you can still find some value. Do you see any parallels to your market? Any thoughts? DOWNLOAD 50 graphs HERE: Please download new market graphs here as a zip file. See my sharing policy for 5 ways to share (please don’t copy verbatim). 1) Housing inventory is clearly on a declining trend. Housing supply has been vanishing over the past few years in light of greater buyer demand, sellers sitting instead of selling, less new construction, increasing sales volume, and other reasons. 2) Housing supply is really sparse (except at the top). Housing supply was low last year, but this year it’s 15-20% lower. Having less listings means it’s really competitive for buyers – especially under $400,000. However, inventory is not low at every price range as there are far more listings at the top. Before freaking out though, this is actually a normal trend we see almost every single month. But the disparity between under $500,000 and above $1,000,000 is striking. As an FYI, it’s worth noting the top of the market does feel a bit soft. 3) Inventory is still not as low as the Blackstone days. It’s true that inventory is anemic, but we have to remember during 2012 and 2013 it was at one month for nearly an entire year when Blackstone and other investors were gutting the market. I mention this because while the market has an aggressive feel, it’s still not what it was. If inventory persists in declining though it will be a bloodbath in terms of competition for buyers (good for sellers though as a developer mentioned to me on Twitter). 4) Inventory was 1400% higher ten years ago during the “bubble”. Ten years ago during the worst of the real estate “bubble” popping we had a 14-month supply of homes for sale (as opposed to one month now). 5) Bank-owned inventory is not a driving factor today. 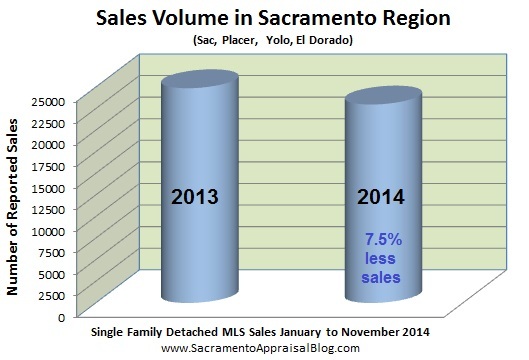 Eight years ago over 70% of all sales in Sacramento County were REOs, but that number is now about 3%. Some folks promise a new “foreclosure wave”, but it’s definitely not here right now. 6) Low inventory is putting pressure on values to increase. Demand is strong right now for both buying and renting, and buyers and tenants are simply gobbling up almost anything out there (I say “almost” because buyers are still sensitive about adverse locations and overpriced homes). Thus it’s not surprising to see the median price is 7% higher than last year, the average sales price is 9% higher, and the average price per sq ft is about 9% higher. Prices increases from February to March were anywhere from 1-3% depending on the metric (this doesn’t mean values went up by 1-3% though). 8) Increasing sales volume is one reason for lower inventory. Housing inventory is the relationship between sales and listings, so if there are more sales and no real change in the number of listings it will naturally mean inventory as a metric will show a decline. Look at the graph above to see all sales since 2013 for the first quarter of the year. Can you see how sales volume is increasing? At the same time we see cash volume declining. This reminds us the market is trying to figure out what normal looks like. It’s healthy to see sales volume growing. 9) Low interest rates have helped take homes off the market. Historically low interest rates have played a big role in shaping inventory in that some owners are sitting on a 3.5% interest rate from years ago and they are simply not going to move unless necessary. Why would they anyway if their replacement home would come with a much higher mortgage? This means there are fewer homes hitting the market that might otherwise sell. 10) Low inventory is causing homes to sell faster. Last year it was taking 5 days longer to sell a home and two years ago in March 2015 it was taking 15 days longer to sell a home. Can you see how low inventory makes a difference in how long it takes to sell? By the way, here is CDOM by price range. As you can see, the higher the price the longer it takes to sell. Just because it is a “hot” market does not mean every property is selling in 3 days. BIG MONTHLY POST NOTE: Once a month I do a big market update (and it’s long purpose). Normally I talk about Placer County and the Sac Region too, but I tore my MCL a few weeks back, so I only had time to focus on Sacramento County in today’s post. Next month I’ll likely be back to normal (but I may change it up too). Questions: Did I miss anything? Any other thoughts as to why inventory is low? How would you describe the market right now? I’d love to hear your take. Slowing down. Competitive. Price sensitive. Still more aggressive than last year. These are all ways I would describe today’s housing market in Sacramento. Let’s unpack the latest trends today to really see the market so we can better understand it and explain it to clients. 4 Hours to write this post: This post usually takes easily 4-5 hours to write each month. Keep in mind I create 50-60 graphs and then break down the trends into bite-sized talking points. I honestly LOVE doing this, and the goal is to be able to use the information for life and business. Why am I mentioning this? I just wanted to let you know how much I value helping us stay in tune with the market. New readers, the three other monthly posts are short, sweet, and general, but this one is long and hyper-local. DOWNLOAD 54 graphs HERE (zip file): Please download all graphs in this post (and more) here as a zip file (or send me an email). Use them for study, for your newsletter, or some on your blog. See my sharing policy for 5 ways to share (please don’t copy verbatim). Thanks. One Paragraph to Describe the Sacramento Market: Last month I talked about how the market has been slowing down. Sometimes when we say “slow”, it can really freak people out. But it’s actually very normal for real estate to soften during the later summer and fall after a more aggressive buying season in the spring. Moreover, when the market does change, it’s simply an opportunity to price more efficiently and explain the changing market to clients. The danger is when we say the same thing about the market all year long despite the trends really not being the same. What are some of the signs of slowing? It took 4 days longer to sell a home last month than the previous month in the Sacramento region. Housing inventory increased slightly in the surrounding four counties last month. The sales to list price ratio decreased by 1% last month. The median price in Sacramento County has been the same for four months in a row. The median price in the Sacramento region has declined by 1% over the past few months. I could go on and on. Of course let’s remember that sales volume is up by a whopping 10.9% so far this year in the region, and housing inventory is actually 22% lower right now in the region compared to the same time last year. Ultimately it’s still very competitive out there as buyers are hungry to get into contract before interest rates rise too much or while they feel like they can still afford the market (that’s so 2004). All year the market has been remarkably price sensitive too, which means buyers have been hesitant to write offers on overpriced homes. As housing supply presumably continues to increase over the next few months, watch out for price reductions to continue to increase, unrealistic expectations from sellers, and buyers gaining more power. The median price has been hovering at $290,000 for 120 days. It took an average of 34 days to sell a house last month (up 3 days from July). Last year at this time it was taking an average of 40 days to sell a house. FHA sales were nearly 27% of all sales in Sacramento County last month. Sales volume is 9.7% higher so far in 2015 compared to last year. Sales volume was 15% higher in August 2015 compared to August 2014. There is a 1.76 month supply of homes for sale (slightly lower than July). Housing inventory is nearly 27% lower right now compared to August 2014. The average price per sq ft is 185 (5.5% higher than last August). The average sales price is $319,636 (slightly lower than past two months). Sales volume was up 12.8% in August 2015 compared to August 2014. Sales volume for the year is up 10.9% compared with 2014. The median price at $328,825 is up 6% from last year, but down 1% from the past two months. It took an average of 39 days to sell a house last month (4 days longer than last month). FHA sales were 23% of all sales in the region last month. There is 2.05 months of housing inventory (up from 1.98 last month). The average sales price is $367,545 (4.2% higher than last year, but down slightly from two months ago at $370K). It took 3 less days to sell a house this August compared to August 2014. FHA sales volume has increased by 30% in 2015 compared with 2014. Housing inventory is nearly 22% lower right now compared to August 2014. Sales volume was up 11.7% in August 2015 compared to August 2014. Sales volume for the year is up 17% compared with 2014. The median price in Placer County is $402,900 (increased from last month, but it’s been hovering from $390-400K generally). Cash sales were 18.5% of all sales last month (very normal level). It took 46 days on average to sell a house last month (6 more days than July). Last year at this time it took 1 day longer to sell a house. FHA sales were 19% of all sales in Placer County last month. There is 2.35 months of housing inventory (up from 2.17 months in July). The average price per sq ft is 201.8 (been hovering around this level for a few months). REOs were less than 2% of all sales and short sales were roughly 2.5% of all sales last month. Remember it is normal for the market to cool off during the latter part of the year. Knowing seasonal cycles and communicating them is key. Price according to the most recent listings that are getting into contract rather than the highest sales from the spring. Remember, it’s normal for housing inventory to increase during the fall, so this will only allow buyers to be more picky. The market is still very price sensitive, which means buyers are not biting on overpriced listings despite inventory and interest rates being relatively low. Price according to the neighborhood market rather than county-wide trends since your neighborhood might be more or less aggressive compared to the entire county. How much did values increase last year in the Sacramento Region? What about Placer County? How would you describe the market to friends or clients? Let’s take a stroll through the trends today. Dude, this is a long post: If you’re new to subscribe (thank you), most of my posts are not this long. But twice a month I break down the local trends so we can better know how the market is moving. If you are outside of the area, you can still glean from what is here. Beyond these two monthly posts, my other posts tend to be general enough to apply throughout the United States. Email me if you want the graphs: If you would like all the graphs in this post (and others), send me an email (make sure to write “I want the market graphs” in the header). You can use these in your newsletter, some on your blog, and some in other social spaces. See my sharing policy for ways to share. 4) Sales volume was down 6.6% in 2014 compared to 2013. 5) FHA sales increased by 4.6% from 2013. 6) There were 32% less cash sales this year. 7) Short sales represented only 6.7% of the entire market in 2014. 8) Bank-owned sales were only 5.8% of all sales in 2014. The graph above shows an increase in the median price at the beginning of the year, but then the market was basically flat for more than half the year. Overall the median price increased by 10.3%, the average price per sq ft increased by 5.3%, and the average price increased by 6.6%. Having 32% less cash sales in 2014 definitely softened up the market compared to 2013. For much of the year there was a sense the market was “normalizing” in that it was learning how to exist without cash investors driving the market, inventory was approaching more normal-ish levels, and interest rates were increasing. Of course now that rates have begun to decline again, that will help put a bit more “steroid” back into the market. There were almost 1800 less sales this year in the Sacramento region, which translated to a sales volume at 6.6% lower than the previous year. This year volume was lower, and we began to get a better picture of what real demand is like in the Sacramento market. In 2012 and 2013 we saw a market that was driven by buyers outside of our market (investors). In short, the demand wasn’t a result of the local market or the local economy. But this year we saw a market that was more driven by local buyers, which is why volume was so much lower than the previous year. Granted, interest rates are still helping buyers afford far more than their wages would otherwise allow, and that’s going to be important to watch over time. Housing inventory saw a clear upward trek throughout 2014. There was not a steady increase every single month, but overall the trend was increasing, wasn’t it? The truth is in real estate some months are going to be higher or lower in a particular category, and sometimes data will even seem conflicting. That’s why we need to look at the big picture as well as hyper-local neighborhood data and county-wide data. It all helps us understand and tell the story of the market. Here is what inventory looks like in December. We should see increases this next month as some properties slowly begin to hit the market. We like to think real estate fever begins in March, but remember the sales in March are often the pendings from February. These days it’s taking about 25% longer to sell a house than it did last year. This sounds alarming, but let’s remember this is normal. We remember the days in mid-2013 when it was actually taking less than 30 days on average to sell a house. That was insane. For context, at the end of 2011 it was taking about 90 days to sell a house in the Sacramento region (that was three years ago). Of course I still recommend pricing to sell in 30 days or less so you hit the sweet spot of buyers looking for properties. In most price ranges you don’t want to be on the market for 90 days right now because you begin to lose your power to negotiate a higher price with buyers. Here is the price spread of current listings in the regional market. The bulk of current listings are priced between 200-400K. We can also see as of last month there were only 50 properties for sale under $100,000. It’s just no longer the market to pick something up for dirt cheap. Last but not least, here is a picture of some of the “layers of the market” working together. 4) Sales volume was down 2.96% in 2014 compared to 2013. 5) FHA sales decreased by 9% from 2013 (76 less sales). 6) There were 19% less cash sales this year. 7) Short sales represented only 5% of the entire market in 2014. 8) Bank-owned sales were only 3.5% of all sales in 2014. How much did the market increase in Placer County last year? Overall the median price increased by 8.1%, the average sales price increased by 6.3%, and the average price per sq ft increased by 7.8%. The market saw some appreciation in the beginning of the year, but was fairly flat and really softened over the last two quarters. The stats actually seem a bit higher than the market felt in light of December’s numbers (which were quite a bit higher than the past few months). For instance, the median price had cooled to $375,000 in October, then $365,000 in November, and then December showed up at $387,000, which is just $1,000 under the highest monthly median price of the year. We’ll see how this figure pans out in coming months, but don’t put too much weight on it. As I said a couple days ago when discussing Sacramento, remember that these figures don’t necessarily mean each property has increased in value by 8.1%, 6.3%, or 7.8%. Actual value is only something we can determine on an individual basis. Housing inventory in Placer County increased steadily throughout the year and was hovering in the higher 2s for the most part. It peaked once over three months at the end of the year, and saw a dramatic Fall to 1.8 months in December (its very normal for inventory to decline in December because there aren’t many new listings coming on the market). Housing inventory was freakishly low in Placer County last month (besides the market about $1M). Keep in mind there are only four listings below $100,000, so don’t put any weight on the “4” number you see for inventory under 100K. Last year at this time it was taking anywhere from 45 to 50 days to sell a house, and this year it was taking anywhere from 55 to 60 days to sell a house. Well, technically on average it took 61 days to sell a house last month in Placer County. It’s normal for properties to take longer to sell in the Fall months, and then shorter when the market heats up during the Spring. As you can see, there are different price segments that tend to sell more quickly than others. Generally speaking, the higher the price, the longer it takes to sell. There were 164 less sales in 2014 in Placer County compared with the previous year. This translates to sales volume being 2.9% lower compared to 2013. In contrast, Sacramento County had a volume that was 7.7% lower than the previous year. It felt like a fairly normal Fall for the most part (beyond the higher uptick in median price). Remember, don’t make too much of the median price. It may have increased 6% from the previous month, but the average price per sq ft only went up 1%. What does that tell us? Real estate is never just about supply and demand. There are so many “layers of the market” that are working to impact the direction of values. Both interest rates and housing inventory will be important factors to watch this coming year. Thanks for letting me post today. I know these posts are long, but twice a month we get to delve into some big-time real estate trends, and I hope it’s been helpful for you (I know it is for me). The more we can explain what the market is doing and why it is doing it, the more we can help our clients make informed real estate decisions. Questions: What else are you seeing out there? Anything you’d add?